Struggling to get your horse to eat his medicine or vitamins? 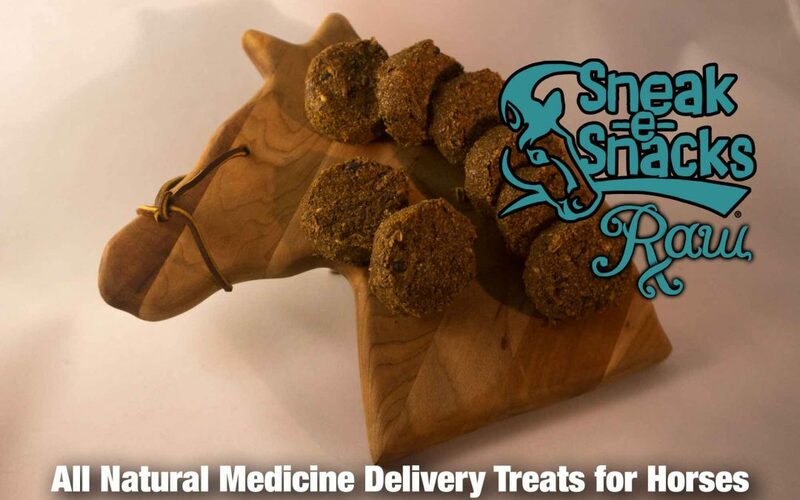 Sneak-e-Snacks® RAW Medicine Delivery Treats are for you! We know you love your horse, but sometimes they just don’t know what’s good for them. Like their daily dose of vitamins, their Cushings medications or their antibiotics. 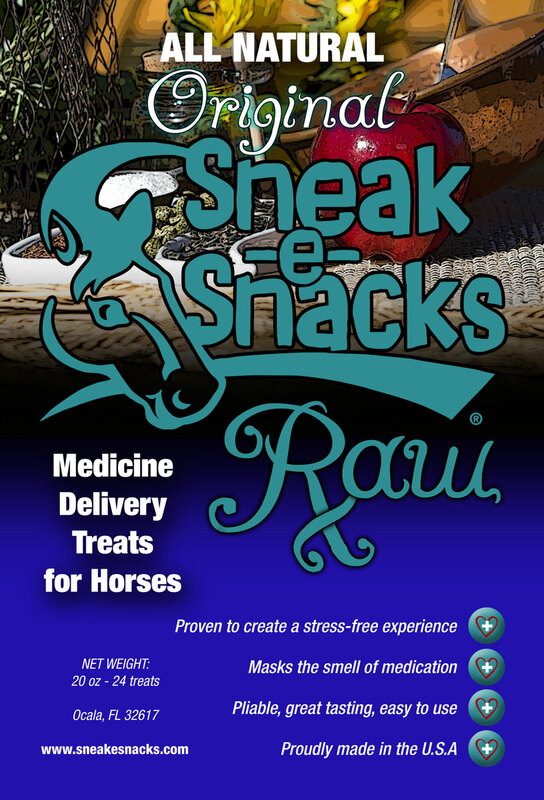 That’s why we developed Sneak-e-Snacks® RAW Medicine Delivery Treats. The same great flavor your horse loves in his treats will get his meds or vitamins into his system naturally and without undue stress or loss of appetite. 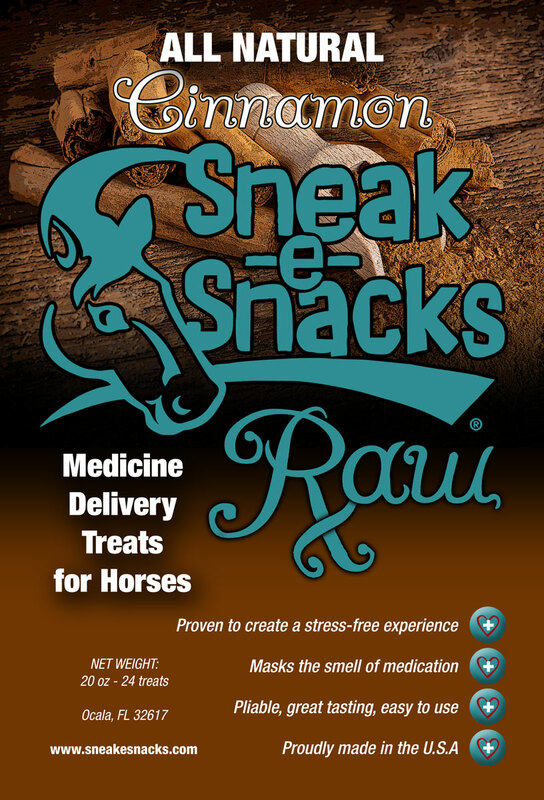 Just like our regular treats, the Sneak-e-Snacks® RAW Medicine Delivery Treats for Horses are MADE IN THE USA and are 100% all natural. 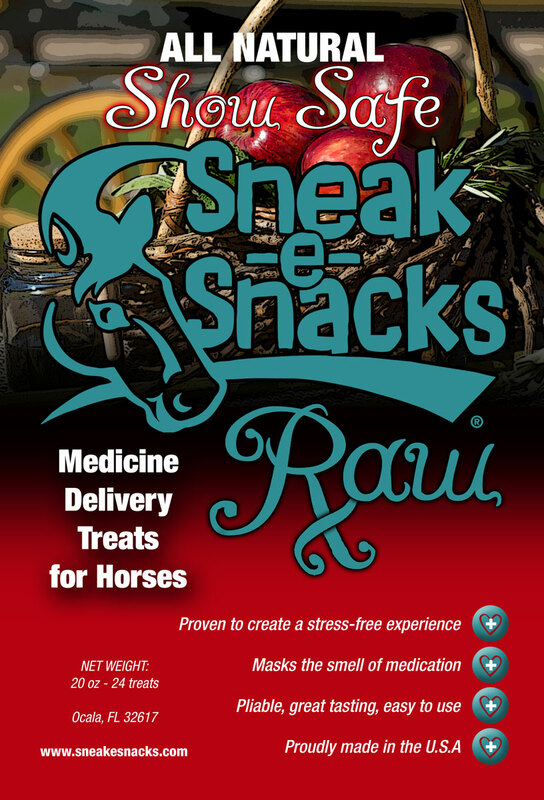 Your horse won’t be able to resist the delicious taste of his favorite treats, and your medicine or supplements will be on their way into his system! Our CINNAMON RAW treats contain NO molasses, corn syrup, oaks, alfalfa or fruit sugars, and NO artificial sugars. Our SHOW SAFE treats contain no ingredients that are forbidden by USEF drug testing. Treats come vacuum packed in a resealable bag. Keep them fresh in your refrigerator or freezer upon arrival. Package of 24 treats (20 oz) or 2 packages of 24 treats (total 48) includes shipping. INGREDIENTS: Original—Soybean hulls, beet pulp, steam rolled barley, steam crimped oats, alfalfa pellets, ground flax seed, cane molasses, apples, wheat middlings, soybean oil, corn, black oil sunflower seeds, stabilized rice bran, brewers dried yeast, yucca schidigera, salt, dried garlic, spearmint, parsley, red clover, rosemary, balm, sage, marjoram, fenugreek and water. GUARANTEED ANALYSIS: Crude Protein, min. 9.4%; Crude Fat, min. 3.7%; Crude Fiber, max 13.6%; Moisture, max 49%; Ash, max 6.6%. All snacks are dated for freshness. Cinnamon—Flax seed, plain shredded beet pulp, 100% pure ground cinnamon, mineral oil, water, sodium propionate (salt). GUARANTEED ANALYSIS: Crude Protein, min. 13.68%; Crude Fat, min. 19.75%; Crude Fiber, max 12.8%; Moisture, max 49%; Carbohydrates 29.4%, Simple sugars (glucose & fructose) 2.67%, TDN (total digestible nutrients) 87.52%. All snacks are dated for freshness. Show Safe—Soybean hulls, beet pulp, steam rolled barley, steam crimped oats, alfalfa pellets, ground flax seed, cane molasses, apples, wheat middlings, soybean oil, corn, black oil sunflower seeds, stabilized rice bran, brewers dried yeast, yucca schidigera, salt, dried garlic, spearmint, parsley, red clover, rosemary, balm, sage, marjoram, fenugreek and water. GUARANTEED ANALYSIS: Crude Protein, min. 9.4%; Crude Fat, min. 3.7%; Crude Fiber, max 13.6%; Moisture, max 49%; Ash, max 6.6%. All snacks are dated for freshness.